When a man has been building boats for 28 years, the perfect boat he builds for himself will be an object of interest. Considering the boats Rob Kirby has specialised in for 18 of those years, it will not surprise that its basis is a Naiad rigid inflatable. It had to have everything in it that should be in it, and provide the best bang for the buck. The length of 6.75 metres was a no brainer as it widened possibilities: it is the critical length for tender operations at Rottnest, and makes it possible to haul up on the beach or berth at the pub jetty. And for over the bow beach boarding, an internal step up to the bow has been incorporated forward; it trebles as an informal seat and the lid to a substantial locker. 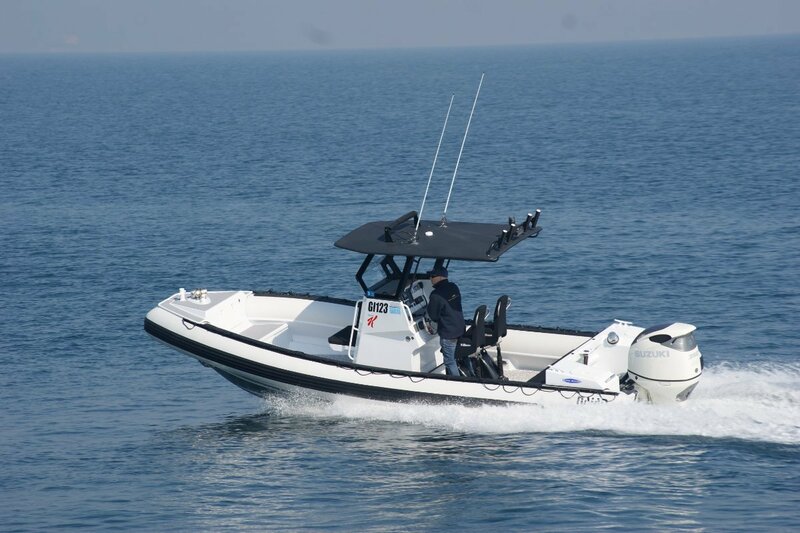 The chosen power unit, a 350hp Suzuki,is more than generous for this size of boat and it has the distinction of contra-rotating propellers. Owner Rob Kirby points out their advantages if the boat gets airborne over the occasional wave. “When you have air under you the boat tends to revolve in the opposite direction to the rotation of a conventional propeller. With this system, if you take off upright you land upright.” Since the boat will be operating without a lot of choice of weather conditions, air riding is on the cards. 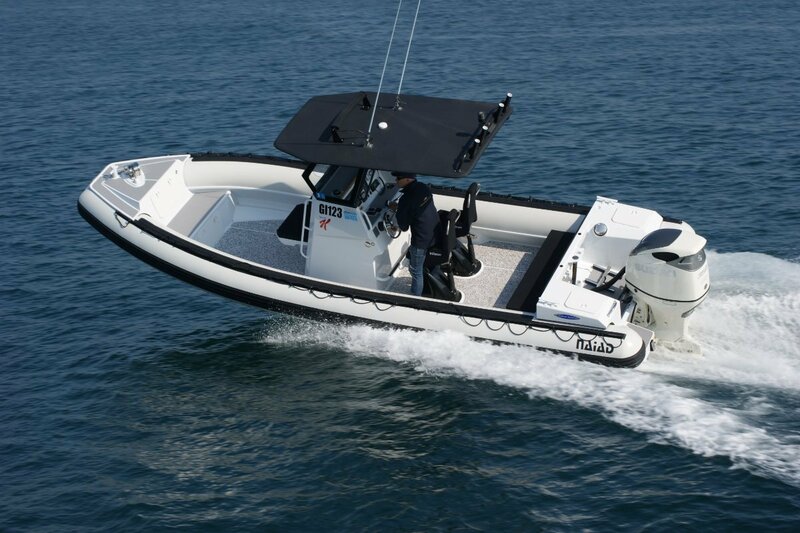 A pair of Lenco trim tabs is mounted mainly for levelling the boat in strong cross winds (every planing hull has a tendency to lean into the wind), but also keeping the trim right as passengers wander around. From time to time there will be big passenger loads, and adjusting tabs is more sociable than ordering people about. The fuel capacity of 540 litres suggests long trips. They are on the cards, but mostly the tank is only partially filled. The quality of ride was most important for the pair that owns the boat, and the Kirby opinion was that in this size of boat a centre console layout will best deliver it – especially for the pair that claims sitting rights at the console. They are not only in a low motion area, but are in also possibly the world’s best suspension seats from Ulman. Stray wind and spray can nullify the comfortable ride so the windscreen is full height, and it is part of the structure, being direct glazed to the console. The T-top covers a larger area than most such structures and, although fabric covered, is tough enough to be walked on; carrying lights it needs to be rigid. For confident passage of mooring areas and the like after dark you want a wide spread of light ahead that illuminates things not to hit but does not cause dazzle. The Naiad has a curved light bar with up there with a spotlight in the middle that aces this job. The console is set out with a mouth watering set of electronics: Furuno TZ2. This is a touch screen operation, but touch screen is only totally reliable at anchor. To cope with occasions when the weather is moving the Ulmans there is also an accessory push button panel. The console has a high volume and could easily accept a toilet. Experience, though, says that guests always bring along far more gear than they need, and it is better stowed than lying on the deck. So this is a giant locker. Usually rigid inflatables are nominally self draining, but decks are low to maximise gunwale height and often some water collects aft. It has been banned here by raising the deck (Seadek sheathed) a shade higher. The number of seats, other than the side tubes, is around eight including the folding rear bench. None of them obstruct fishing or diving operations. For the latter there is a good ladder and a fresh water shower; for the former, a little more: a heavy duty bait board, a pot winch plus hauling arm, and rod holders. If either of those bore you there is a ski pole. Not cheap at $220,000, but for the boat of a lifetime?